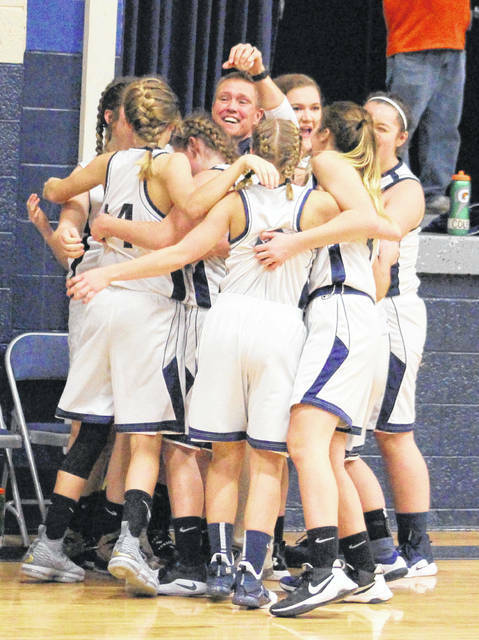 Hannan junior Julie Frazier (4) hauls in the eventual game-winning rebound while being surrounded by both teammates and Ironton Saint Joseph defenders during the fourth quarter of Monday night’s girls basketball contest in Ashton, W.Va.
Hannan girls basketball coach Kellie Thomas, middle, celebrates with her team after the Lady Cats pulled off a 41-40 victory over Ironton Saint Joseph on Monday night in Ashton, W.Va.
ASHTON, W.Va. — It was far from perfect, but it still ended up being ‘purr-fect’ enough for these Lady Cats. 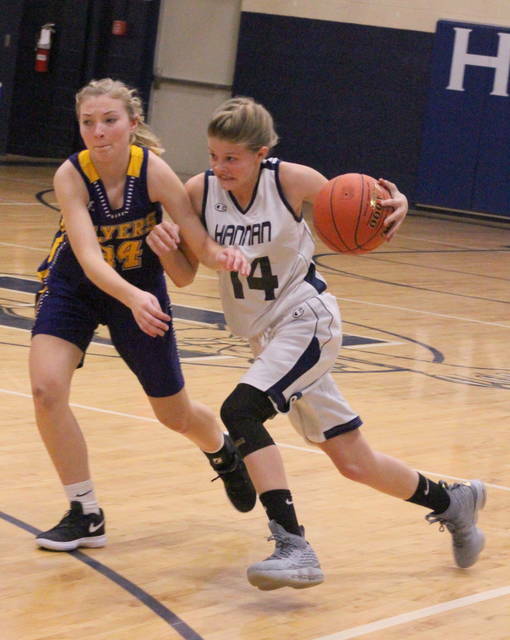 Despite committing 29 turnovers, the Hannan girls basketball team still managed to do just enough on Monday night to open its 2018-19 season on a solid note following a thrilling 41-40 victory over visiting Ironton Saint Joseph in a non-conference matchup in Mason County. 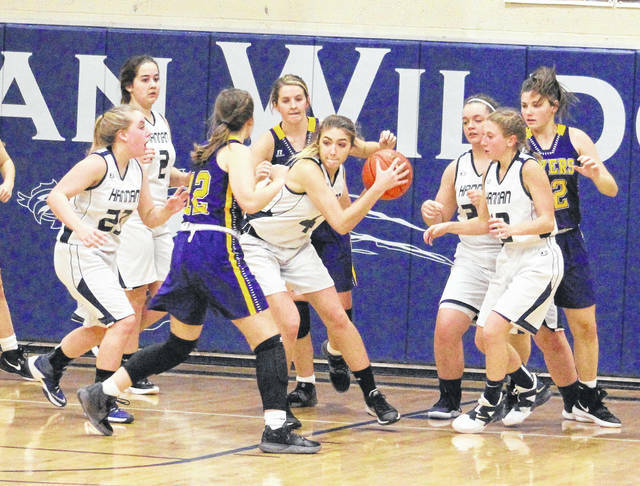 The Lady Wildcats (1-0) committed nine first quarter turnovers as the Lady Flyers (1-2) stormed out to a 10-4 advantage, but the hosts rallied by hitting 5-of-9 field goal attempts during a 14-8 second quarter surge that led to an 18-16 deficit at the break. Ironton St. Joe — which led by as many as eight points in the opening half — made a small 4-2 run to start the second half, but freshman Kaleigh Sturgeon scored eight straight Hannan points as part of an 8-3 run that gave the hosts a 26-25 cushion with 45 seconds remaining in the third canto. Halie Johnson tacked on a free throw with 22 seconds remaining to give the Lady Cats a 27-25 edge headed into the finale. ISJHS managed to tie the game at 29-all and completed an 8-3 run for a 33-30 cushion with 5:34 remaining, but the Purple and Gold were held scoreless over the next two minutes as Hannan made an 8-0 run to secure its largest lead of the night at 38-33 with 3:33 left in regulation. The Lady Flyers countered with a 7-2 surge over the next three-plus minutes as Faith Mahlmeister tied the game at 40-all following an offensive putback with 17 seconds remaining. Pammie Ochs was fouled on Hannan’s ensuing possession, and the senior sank the second of two free throws to give the Blue and White a slim 41-40 advantage with 13.8 seconds left. Ironton St. Joe came away with a pair of decent looks at a go-ahead bucket — including an offensive putback attempt by Mahlmeister from 10 feet out — but both shots ended up missing the mark. Julie Frazier hauled in the rebound while being surrounded by both teams, dribbled away from the crowd and simply waited for time to expire on Hannan’s season-opening triumph. As the horn expired, the Lady Cats jumped in celebration while making their way to the sideline — where HHS coach Kellie Thomas was being embraced by her coaching staff and bench players. Afterwards, Thomas spoke about her team’s growth and resiliency, as well as the collective contributions made in reaching this glorious outcome. “I’m so excited for these girls because they worked so hard all night long. At no point did they ever give up and we had a lot of different people contribute to the is win,” Thomas said. “We had some younger players come off the bench and make some big contributions, plus the girls just stepped it up when we needed to. The game itself featured four ties and nine lead changes, and both squads held at least one lead in each of the four quarters of play. Hannan never led by more than two points in the first half, plus trailed by six (10-4) after the first period and was down 12-4 two minutes into the second canto. The Lady Flyers, however, went just 2-of-8 from the field after taking their largest lead, and the hosts made a 12-3 charge to claim their final first half lead at 16-15 with 33 seconds remaining. Bella Whaley nailed a trifecta 25 seconds later, allowing the Purple and Gold to take a minimal 18-16 cushion into the intermission. Frazier’s only field goal of the night came at the 3:50 mark of the fourth, as her trifecta ended up giving Hannan a permanent lead at 35-33. Frazier also hit a free throw at the 2:07 mark for a 39-34 advantage. The Lady Cats went only 2-of-5 from the field in the fourth quarter, but netted 9-of-19 free throw attempts to make up for the lack of offensive opportunities. Ironton St. Joe, conversely, made only six of its 15 second half free throw attempts and also had 13 turnovers in the setback. Hannan connected on 14-of-39 field goal attempts for 36 percent, including a 3-of-9 effort from 3-point range for 33 percent. The hosts also grabbed 49 total rebounds, with 11 of those coming on the offensive glass. Sturgeon paced HHS with 12 points, followed by Bailey Coleman and Halie Johnson with eight markers apiece. Frazier was next with four points and Madison Gill added three markers. Ochs, Josie McCoy and Rachel Ellis completed the winning tally with two points each. Frazier and Johnson each grabbed 10 rebounds apiece, while McCoy, Coleman and Ellis hauled in six boards each. The hosts finished the night 10-of-21 at the free throw line for 48 percent, while the Lady Flyers were 8-of-21 at the charity stripe for 38 percent. The guests were 15-of-58 from the field for 29 percent, including a 2-of-15 effort from behind the arc for 13 percent. ISJHS pulled in 33 total rebounds, with 19 of those coming on the offensive glass. Emma Whaley and Bella Whaley paced the Ironton Saint Joseph with 12 points apiece, followed by Mahlmeister with seven points and a team-best eight rebounds. Emilee Blankenship was next with five points, while Chloe Sheridan and Laiken Unger completed the tally with two points each. Hannan hosts Calvary on Tuesday night and returns to action Friday when it welcomes Ohio Valley Christian for a 6 p.m. tipoff.